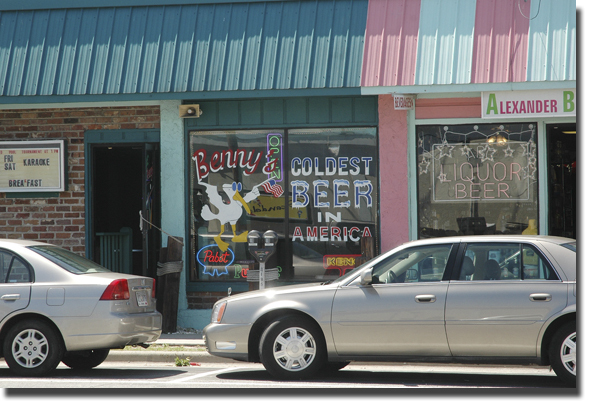 The painted sign in the window of the bar boasted ‘Coldest beer in America’. My husband winked at me and said, “A bold claim... We must go see if this is indeed true.” So that is how we met Benny. Our eyes had a difficult time adjusting from the bright outdoor light as we entered the darkness of Benny's Bar on Tybee Island. The radio was blasting Donna Fargo singing something about having a 'Skippidity do da day ' but a quick glance at the noon clientele told me that most of their skips these days were reserved for just getting to Benny’s in the morning. “The coldest beer in town,” replied husband. Benny quickly corrected him, “In America,” he emphasized. “We heard tale you had some hot dogs round here as well,” said husband. “Yep. Beer steamed, gives ‘em a sweetish bite,” Benny said. “We’ll take three then,” said husband. Not much to add to the local colorful conversation. If you go to Tybee Island, please go spend money in Benny's Bar. And, be sure to check out Georgia Kyle and the Tybee Two who play every Thursday at Fannie's . For a bunch of flatlanders, they sure can play the puddin' out of some hillbilly songs. And here's a hefty tip: Don't waste your money at Spanky's---the idiots there sell chili, fries and nacho cheese, but haven't figured out how to put the chili and cheese upon the fries without individually selling each item. Clearly the owner doesn't keep tab on his employees.